Fourth-grader Morgan Henry meets Lewis when Lewis is stuck hanging in a tree with a “giant wedgie.” A line drawing of exactly how Lewis’s underwear was twisted on a protruding stick to cause this situation dispels any reader confusion. Lewis has just moved to town, and the boys bond after Morgan cuts him from the aforementioned tree. 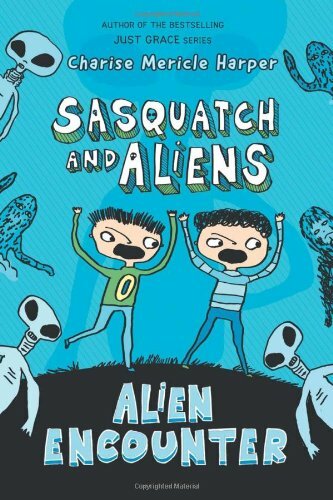 This whole book, in fact, is right up the tree of seven to ten year olds (males disproportionately) who like their aliens and Sasquatches thrown together, and who sit up and take note when the word underpants enters the conversation. If they giggle at physical humor and the occasional reference to a bodily function, all the better. Harper balances her surefire humor with an engaging plot. When the boys revisit the scene of the massive tree wedgie, they see something truly astounding: an alien. Police and newspaper reporters are called in. The boys give descriptions and draw more pictures. Sadly, local interest wanes quickly, and it’s up to the boys to get to the bottom of the mystery. The truth turns out to be complicated and is revealed only after some spooky moments. It involves Morgan’s strange neighbor Mr. Lee who hates Halloween and whose wife’s backyard picnic lunch was notoriously eaten by a bear a few weeks prior. It also involves a Sasquatch hunter named Mr. Holland, and Morgan’s 12-year-old sister Betty’s misshapen sweater she’s knitting for her imaginary boyfriend. Morgan says, “Jason was Betty’s pretend boyfriend. He was 100 percent not real. It was something all her friends were doing. They said it was so they could get practice being girlfriends so that on the day when a real boy asked them out, they’d be ready. . . Betty had a long wait ahead of her . . .” The worst part is, Morgan’s forbidden by his parents to make fun of either Betty or Jason. The story unfolds in readable sections with plenty of edifying drawings, and enticing headlines like: “The One Thing You Should Be Scared of if You Hear It in the Woods,” or “The First Ever Underpants Picnic.” Morgan also writes acrostics—lines of verse that start with each letter of a name or word. The target audience will find no shortage of things to enjoy about this book besides aliens and Sasquatches, including: a little blood, gravity (as in falling), Lewis’s home—a creepy old motel—alien hunters, a clubhouse, knitting, suspicious muffins, piles of old mattresses to do flips into, both the joys and trials of a best friend, a scary, secret underground room, and vicious prickle bushes. There’s a requisite goofy dad, as well. Harper deftly knits together plot yarns for a satisfying and unexpected ending. A loose end or character with no apparent purpose will surely turn up in the next book. And naturally, there are a few mysteries left to be solved in Book 2 of the Sasquatch and Aliens Series. Ann Jacobus is the author of YA thriller Romancing the Dark in the City of Light (St. Martin’s Press, 2015). She blogs about children’s literature and teaches writing for young readers in San Francisco.